Undoubtedly, if you have spent any length of time in Cincinnati someone has asked you this question. And if you grew up in the area, you have likely asked it of someone else. Some people may ask this question as a way to reminisce about simpler times. But more often than not, the question is a means of categorizing someone. Is this person from the more industrial west side, or the more developed east side? Is this person accustomed to urban or suburban living? Is he/she from a religious family? A wealthy family? Of course, in a larger sense there is nothing wrong with identifying area neighborhoods by the noticeable differences between physical layout, architecture, culture, and/or demographics. The problem that seems to occur all too often in Cincinnati, though, is that these identification techniques are used to spread negative stereotypes about places and their inhabitants. While residents of a neighborhood may feel a certain pride towards that location, commonly this pride brings them to the belief that they are better than anyone else from an “inferior” neighborhood. Am I exaggerating? Think of some of the stereotypes you may have heard. West Chester residents are spoiled. Those from Mason, or Anderson Township, or some other suburb do not really value Cincinnati’s urban core. Hyde Park residents are rich snobs. Northsiders are either all homosexuals or all yuppies and drug addicts. Over-the-Rhine is only full of poor blacks and newly-borne “hipsters” ignorant of the area’s history. And I’m not even going to touch on what I’ve heard people say about Northern Kentuckians. Let’s stop right there. I’ll admit: I did not grow up in Cincinnati, so I am somewhat less in-tune to the stereotypes. Even so, I have caught on quickly that residents like to pit themselves against one another. This is not a rare phenomenon. But, let’s compare this occurrence to another city for a minute: New York City, most specifically the borough of Manhattan. Anyone who visits this city for a brief time will quickly make a very interesting observation. Though New York City is one of the most ethnically and culturally diverse cities in the world, its neighborhoods are still highly segregated. A visitor knows when he/she is in Harlem, Little Italy, El Barrio, Chinatown, or Greenwich Village. However, this segregation is used to celebrate the individual cultures that make up the city. Unique foods and shops align the streets of such neighborhoods. Festivals highlight the positives of each neighborhood, while negative stereotypes do not comprise everyday conversations to the extent that they do in Cincinnati. Of course, Cincinnati can never compare in size or diversity to New York City. However, the concept of celebrating individual neighborhoods is still a valid concept that should be more aggressively pursued in order to erase the negative stereotypes that dominate conversations and create positive ones for the city. The easiest way to change attitudes is to better recognize and honor the cultural history and diversity of the city. This can be achieved through “marketing” campaigns (tourist pamphlets, road signs, etc. ), cultural centers, and/or special events and festivals. Such is already done extensively to celebrate the city’s strong German heritage. One cannot claim that the city has failed in this respect. However, what about the other cultural and ethnic segments? The strong Irish-American heritage seems largely ignored, save for a pub here or there. There are large Greek and Jewish populations in the city that get little recognition. Though there is a small Italian festival in Cheviot every year, otherwise most other European immigrant classes and their importance to the city’s history are shunned. Further, what about the growing classes of Asian and Latino residents? 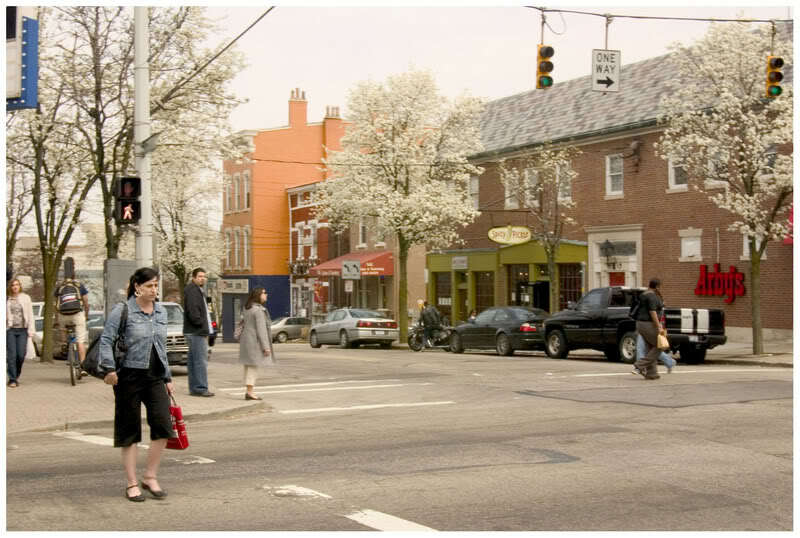 Uptown boasts large segments of both eastern Asian (Chinese, Korean, Vietnamese, etc.) and Indian residents. Surely, the mixture of Asian and Indian restaurants in the Clifton and CUF areas helps to represent these groups of people. But would it not be a terrific goal to begin some cultural event that further honors these newcomers and welcomes them as Cincinnati residents rather than regarding them as outsiders? Ethnicity is just one demographic variable that defines citizens and shapes differences between people in an area. Cultural values can also shape neighborhoods. For example, the underground art and music scenes in Cincinnati are phenomenal, and are well represented by downtown, Over-the-Rhine, Northside, and—to a lesser extent—Mt. Adams. These and other neighborhoods should continue to capitalize on this strength, and develop “niches” for different art and music scenes in different neighborhoods. On another note, the city’s complex history is part of what makes it great. But why is the most historical focus placed upon downtown and Over-the-Rhine? What about the great history of residences in Corryville, Mt. Auburn, or Walnut Hills? What about the unfortunate demolition that occurred due to interstate construction in the West End and Mt. Adams? Could this not be better emphasized as a way to both celebrate the neighborhoods’ history and call for a more optimistic and respectful future? Other cultural differences exist between neighborhoods that could be further highlighted and/or expanded. On a positive note, the LGBT community has managed to highlight Northside (as well as Clifton, to a lesser extent) as an open and accepting community. Is there any reason why this openness, not just to the LGBT community but to diverse groups of people in general, could not occur in other neighborhoods? Further, what about the strong sense of ecology that is shown in some neighborhoods that could positively spread to others? For example, why isn’t there more of an interest in or draw to Price Hill’s Ecovillage? Cincinnati’s great park system has been written about extensively, but why do certain neighborhoods not do more to utilize these parks? For instance, some neighborhood parks at the peaks of “hills” offer some astounding views of Cincinnati. Also, more specifically, some parks such as Burnet Woods in Uptown seem underutilized, and it is unfathomable why Cincinnati does not better vocalize Mt. Airy Forest’s great hiking trails. I have already listed a plethora of examples of missed opportunities to more positively portray the citizens, places, and events within area neighborhoods. Surely, there are many more. But the larger point is this: if the cultural diversity, great history, and interesting landmarks already exist in neighborhoods, it does not take massive development or great political upheavals to make people love the city; it only takes a change in attitude. So, instead of bickering over which area high schools are best, or why east-siders are better than west-siders, or why the young/old/liberal/conservative/rich/poor/white/black/[name your stereotype] people of the city are “ruining” everything, let’s focus instead of what makes any city great: its variety and diversity. For in reality, as much as many of us (myself included) wish for this or that development, change, etc., we all know deep down that despite its “flaws” (whatever each of us individually considers such flaws to be), Cincinnati is a great city with a lot to offer. Thus, by better recognizing and marketing what is great about the different neighborhoods in our city, we can begin to change what is often an overall negative attitude into a positive one. A positive attitude should draw new residents into the city, and help them feel accepted and wanted, thus helping our city grow and prosper like any great city should. Consciously and sub-consciously, shouldn’t this be what we are all striving towards? At least until football season starts again. Then everyone can go back to arguing about which area high school is best. Zachary Schunn is a recent graduate of the Bachelor of Science in Architecture program at the University of Cincinnati, and is currently completing the Master of Business Administraion program at UC, with a concentration in Real Estate Development. He has a growing interest and expertise in sustainable urban architecture and development, and is committed to seeing its growth in Cincinnati.